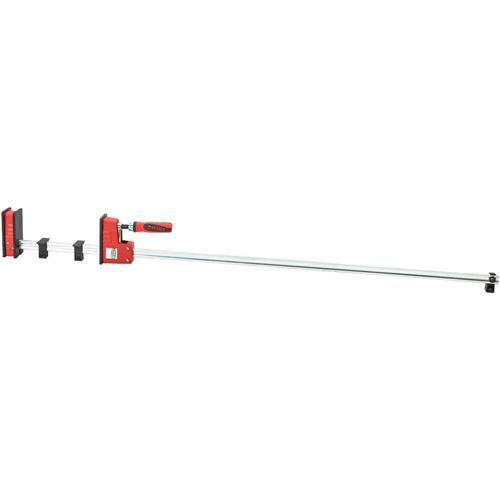 This K Body REVO clamp range from BESSEY offers some 30% more clamping force, and newly-designed pressure caps and work-piece contact elements also protect the work-piece exceptionally well. The REVO clamp enables the head to be adjusted at the press of a button. The new K Body REVO clamp from BESSEY achieves a powerful 7,000 N clamping force - some 2,000 N more than usual. In addition, the jaw face has been increased by 30-Percent. Three removable and glue-repellent pressure caps guarantee work piece protection. Adjustable work piece contact elements prevent direct contact between the work piece and the serrated steel rail under full utilization of the jaw face. I've been buying bessey clamps for 15 plus years and I still have the first ones I bought and they still work awesome!! These are the best clamps I have found for woodworking. High quality and very durable.